Hardeep Phull of the New York Post spoke with Metallica frontman James Hetfield. The entire interview appears below. NYP: Last year, Lars talked about his special pancakes that help keep his energy levels up. Do you partake, or do you have your own health silver bullet? James Hetfield: The Danish chalk-cakes are what I call them. He puts some kind of yogurt in there that’s really chalky. They don’t taste horrible, but I don’t know how you could eat them all the time. Lars has expanded a little now — he is a total foodie. He thinks chefs are the new rock stars. I’ll eat pretty much anything in moderation, which is not a word that has been uttered a lot in the Metallica world. NYP: Metallica’s performance with Lady Gaga at the Grammys was a show stealer. Do you think the microphone malfunction made it even more exciting? James Hetfield: I felt embarrassed — I haven’t been that angry in a long time. When something out of my control goes wrong, I still get wound up. I’m sure it taps into other stuff from my past, but I felt helpless. I agree, it ended up being a blessing because I ended up singing in a microphone with Lady Gaga — maybe even more than she wanted. It felt more like a real collaboration because of that. NYP: You’ve said that beekeeping is one of your recently developed hobbies. Have you had any mishaps? 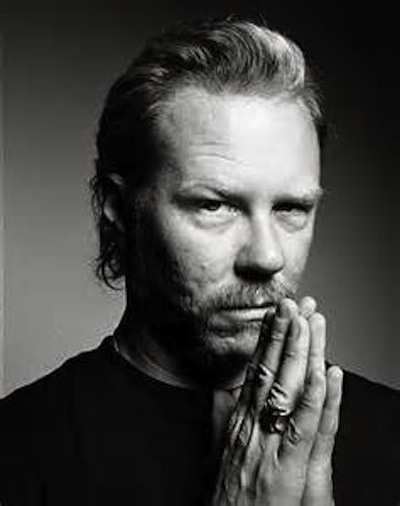 James Hetfield: Yeah, there are a few stories. I had to move a hive one time, and one bee got perturbed, and that sets them all off. I’m in my bee suit — everything’s fine except I didn’t put my boots on because it was hot. One area of my ankle was exposed and, of course, I end up with about 20 bee stings. If one stings you there, they all sense it and swarm there. That was not fun. I just had to throw my foot in a bucket of ice. NYP: It’s so common to see celebrities wearing Metallica T-shirts now. Does it ever bother you? James Hatfield: I remember when that whole Justin Bieber wearing a Metallica T-shirt went viral, I thought “So what?” This is America, you can wear whatever the f - - k you want. If he doesn’t know the history of the band or whatever, it’s fine. I wear lots of stuff and I have no idea of the history, I just like the logo. People try to shock me sometimes and they’ll say, “My grandma headbangs to your music — and she’s 120!,” or “I named my baby after you.” I’m like, “OK, cool.” I’m not surprised that anyone likes Metallica. Everyone is welcome here. From cradle to grave, we’ve got you covered. James is a way better sport than I, I HATE when celebrities wear metal t-shirts as fashion accessories, it annoys me beyond belief. I recently saw a picture of Kourtney Kardoucheian (yes, I purposely spelled it that way) wearing a Judas Priest shirt, BARF. I guarantee she cannot name one song, and since that is my favorite band, that one really got my goat. Apparently, Iron Madien shirts are the most coveted, just as Hillary Duff, Miley Cyrus, Kayne West, Lindsay Lohan and Kelly Rowland. Ugh, accompanied by a serious eye roll. And yet every one of those idiots goes absolutely berserk if they think someone is guilty of “cultural appropriation” (ie. allegedly borrowing from another culture to make music or just look cool). That cultural appropriation argument pretty much sums up the hypocrisy. James is such a real dude. No ego, family guy, and he just seems so genuine. James is the equivalent of Tony Iommi, as far as being a riff master for his style of music. As far as celebrities wearing metal shirts as an accessory, yes it bothers me. I wear my Tank, Angel Witch, Slayer, etc… t shirts cuz i’m proud to wave the metal flag. And I’d wear them everywhere, if my wife would let me :o) But, I think for celebrities to wear them to try to be cool is not cool. And it bothers me because i know the passion that I/we all have for this music is not out of fashion or trend…its because we all love it, embrace it as part of our lives, and it’s meaningful to us.